George Papandreou, Greece’s prime minister, has called for an autumn referendum to amend the country’s constitution and make changes to the political system. Meanwhile, EU finance ministers have failed to decide on a second bail-out for Athens. ­Papandreou, addressing the Parliament on Sunday, did not elaborate on the exact changes and amendments to be put forward in the referendum. But the intended constitutional revision will at least facilitate prosecution of delinquent government officials, who, according to Papandreou, are to be blamed for the black hole Greece finances have turned into. 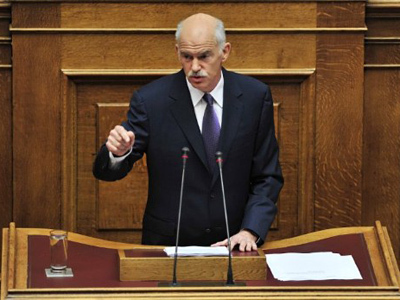 Papandreou also called on the parliamentarians to give a vote of confidence to his newly-reshuffled government. “I ask for the vote of confidence as the country is at a critical crossroads,” said Papandreou, warning that a picture of division among Greeks was not helping the country. According to Papandreou, Greece needs to implement budget cuts, co-ordinated with the EU and IMF, otherwise the country will have to default on its debt obligations worth of 350 billion euros. This would devastate the banking sector, Papandreou explained. Despite the 110-billion-euro credit support from the EU and IMF, the country’s financial reserves will soon be depleted, if the country does not receive another 12-billion-euro loan tranche, he added. The vote of confidence is expected to take place in the Greek parliament on late Tuesday after a three-day debate. Next week is also scheduled to vote on 28 billion euros of budget cuts to be implemented up to 2015. ­Meanwhile on Sunday evening, eurozone finance ministers failed to agree on details for releasing the 12-billion-euro loan tranche that PM Papandreou has been discussing in parliament. The decision was postponed until July, with the condition that Athens implements fresh budget cuts and privatization program. “We reminded the Greek government forcefully that by the end of this month they have to work so that we are all convinced that all the commitments they made have been fulfilled,” Luxemburg’s Prime Minister Jean-Claude Juncker said. 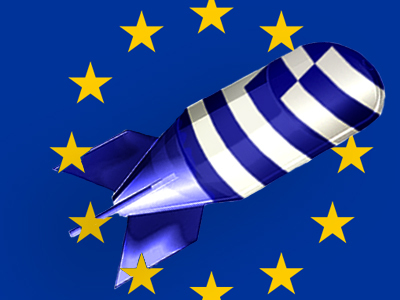 It would be the fifth tranche for Greece and the last of the 110-billion-euro aid package agreed in May 2010. With 8.7 billion euros of the tranche to be provided by the eurozone countries, the EU ministers will have to ponder how banks and private investors could contribute to a second bailout for the southern European country. Besides the tranche, Greece now requires at least 100 billion euros in fresh loans to cover its borrowing needs for the next three years. EU finance ministers are still to agree on the structure of a second bail-out, which is expected to be approximately same size as the 2010 package. The International Monetary Fund has promised not to hold up the aid payment to Greece, even if the second bail-out deal is not reached by Monday. Still, a final bail-out deal is not expected until July 11, which is scheduled as the next meeting of EU finance ministers in Brussels, EU officials say. Greece’s newly-appointed Finance Minister Evangelos Venizelos will have to tackle the task of convincing the EU ministers to release the tranche and consider a second bail-out to save struggling Greece. Evangelos Venizelos, the former defense minister, was announced as the new Greek FM in a Friday cabinet reshuffle. Besides Venizelos, the second upgrade of the cabinet in 2011 has installed new foreign and internal affairs ministers and a new minister of defense – all in the sake of pushing through a four-year package of further tax increases and spending cuts agreed with international lenders. 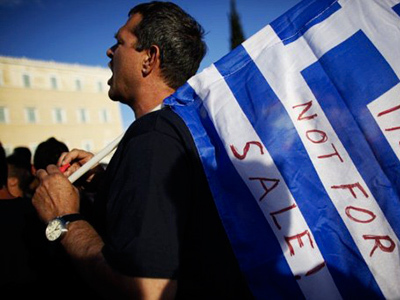 The performance of PM Papandreou’s previous team has escalated social unrest in Greece. Papandreou, seeking a vote of confidence for his new government, hopes to receive a mandate to implement the unpopular social reforms. Thousands of protesters who each afternoon take to Athens' central square in front of the parliament are wearing stickers saying "We owe nothing, we'll sell nothing, we'll pay nothing," reports AP. 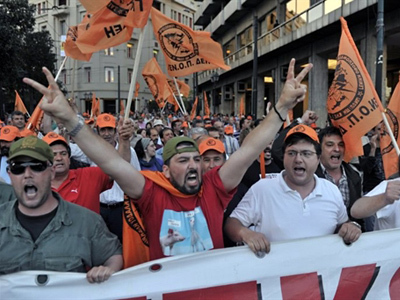 The demonstrators reject creditors' demands to sell off state assets and are asking the government to get rid of the IMF. The same message has been received by European banks, which are not acting properly in response to the crisis in EU countries, says Vanoost.